Decking Paint | Decking Colour & Protection | Which are Best? Decking paint products are a great alternative to traditional decking treatments such as decking oils and decking stains. Whereas decking oils and stains are all about retaining the natural appearance of the wood grain, deck paints are designed to give a modern alternative look to new and old garden decks. Available in a range of trendy, opaque colours and especially ideal for old decking that is perhaps looking a little worse for wear, deck paint is great for a quick makeover when a major decking restoration project isn’t possible. 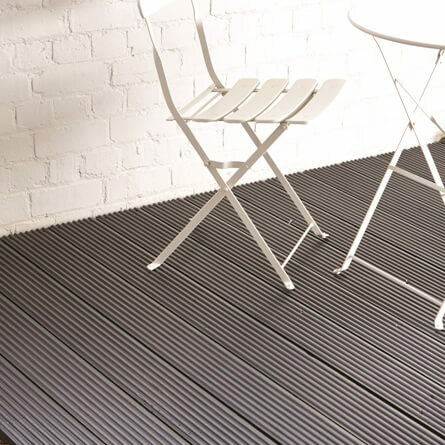 Decking paints however are perfectly suitable for new decking if an alternative look is desired. With colours that include White Wash, Deep Blue, Charcoal, Warm Stone, Dark Silver, Gun Metal and more, transforming the appearance of any decking, ridged or smooth, softwood or hardwood couldn’t be easier. Decked areas to be painted should be clean, dry and free from surface dirt, grit and other surface contaminates. Looking for a decking oil or stain? Find out more about both on our decking oil and decking stain pages. Please note: Decking Paint may not be suitable for decking that has been oiled in the last 12 to 24 months. Decking paints may also be incompatible with decking that has been treated with a wax or silicon based preservative or water sealer. Always do a test area before starting any decking project.